Coach Adam Gase gave his players the rest of the week off, and said if his team had a game Sunday, finding 46 healthy players to fill the active roster would be a challenge. DAVIE, Fla. (AP) — Frank Gore walked slowly through the Miami Dolphins locker room Monday, a slight hunch in his posture and a slight limp in his gait, which made him look like the 35-year-old running back he is. And he’s among the healthy ones. The Dolphins (5-5) hobbled into their bye week thankful for the timing of the break. Coach Adam Gase gave his players the rest of the week off, and said if his team had a game Sunday, finding 46 healthy players to fill the active roster would be a challenge. “I don’t even know if we’d have enough,” Gase said. For one thing, the bye buys quarterback Ryan Tannehill an extra week to continue his recovery from an injured capsule in his throwing shoulder. After a period of rest he began a throwing program Sunday. The goal remains for Tannehill to return for Miami’s next game Nov. 25 at Indianapolis. “If we can get through this week and he feels great every day, then we’ve got a shot,” Gase said. The odds seem against it. 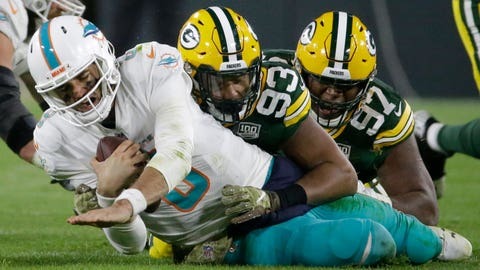 Tannehill was shut down after an earlier throwing program produced little progress, and missed his fifth game in a row Sunday when Miami was beaten at Green Bay. Brock Osweiler fell to 2-3 replacing Tannehill. And as the Dolphins lost for the fifth time in seven games, their injury list grew longer. Sidelined were cornerback Bobby McCain (concussion) and receivers DeVante Parker (shoulder) and Jakeem Grant (calf). Both receivers underwent MRIs on Monday, and their injuries are not believed to be season enders. By the final whistle, Miami was without five former first-round draft picks. That included starting tackles Tunsil and Ja’Wuan James, who both missed the game with knee injuries. There’s a good chance they’ll return against Indy. Given the way the Dolphins’ season is trending, it’s surprising the Colts game could be pivotal in the AFC wild-card race. Last week the Dolphins had 18 players on their injury report. But not Gore, the ageless veteran who ran for 90 yards in 13 carries Sunday. He became the first player to rush for 500 yards in 14 consecutive seasons, and hasn’t missed a game since 2011. In the Dolphins’ locker room, that makes him an outlier.